The Templates page is where you can set up your cart reminder email campaign. You can decide how many emails you'd like to send, when you'd like to send them, and what you'd like them to say. You can send 1-3 cart reminder emails. Turn an email on by changing the Send Status to On. 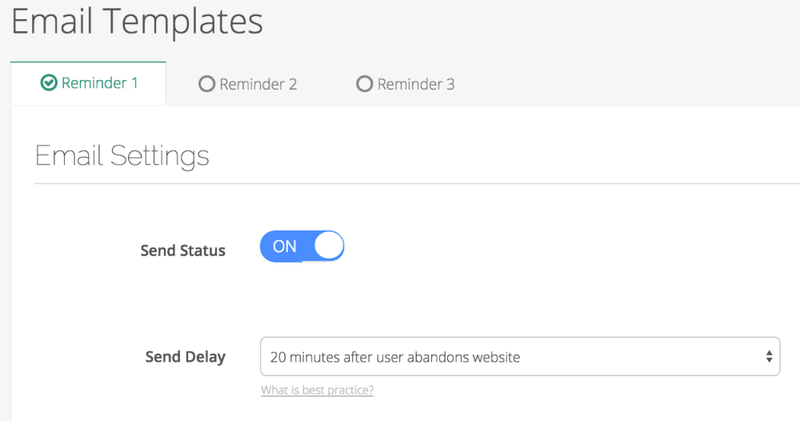 Choose when you'd like to send each email by adjusting the Send Delay. We recommend using a support tone in the first email. For the second and third email, messages that communicate benefit to a customer or create a sense of urgency are more likely to be opened. Be sure to know your audience and stay true to your brand, whether it's chic or silly. For more ideas, check out our help doc, Example Email Campaigns. To get you started we dropped in a placeholder subject line and email content. Modify the content as needed by adding a link to your site's cart page and inserting your company's contact information. Use our email builder to customize your campaign to match your website branding. Wish you could display a customer's name or a unique coupon code in your emails? You can! The setDataItem is a way to pass custom data into CartStack so it can be used to personalize your email templates. It's often thought of as our custom fields solution. Once the data has been passed into our system you can display it by adding a simple variable to your email template. Learn how to use the setDataItem here.